Smart shopper: make your greens do doube duty. There are a few foods I can’t live without: oatmeal (duh), chocolate, greek yogurt, and salad greens. I can go through a family-sized container of greens fast enough that it forces me to go to the grocery store, so I’ve become very well acquainted with the options out there. Arugala is a favorite, but I see it as a special treat since it is often expensive and it’s not as versatile as many of the other options. Often, I’m left deciding between spring mix and baby spinach. Spinach is super high in iron, and can easily be thrown into an omelet or stir fry for a boost of nutrition, but when it comes to salads, the flat leaves are difficult to spear on a fork and often stick together – the texture just isn’t ideal. This is where spring mix shines: the variety of shapes and flavors of lettuces makes for a delicious and functionally excellent salad. Lately, I’ve noticed something different though. Instead of just selling pre-washed greens in tiny one or two-serving bags or giant plastic bins, stores are stocking giant bags of ready-to-go spinach, collareds, and chopped kale for cooking. 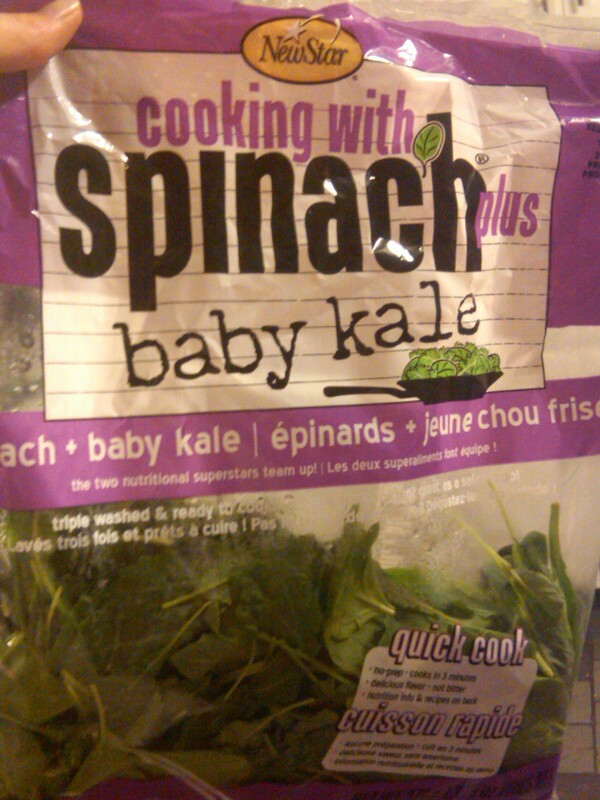 I had already begun to choose this cost-efficient option for my baby spinach, but I was so excited to stumble across my most recent grocery store gem: bagged spinach and baby kale! This combo has a variety of textures that is sturdy enough to stand up through cooking (and a little extra time in the refrigerator), but delicate enough to turn into a delicious salad! So far I have tossed the tender and nutritious leaves with red onion, tomato, avocado, lemon juice and olive oil for a salad to take to work; and stirred it in with zucchini lo mein with teriyaki salmon. Both were delicious! – Regular (not baby) kale. Just massage for a salad! – Red onion. I’m a fan of red versus white onions on my salads. – Tomato. A salad essential, and one of my favorite omelet ingredients! This entry was posted in Living Well, Nutrition and tagged grocery store tips, kale, salad greens, smart shopping, spinach, versatile vegetables. Bookmark the permalink. 2 Responses to Smart shopper: make your greens do doube duty. I have been big on zucchini lately too, so versatile!